The Garmin GPSMAP 78SC is a rugged marine handheld GPS that floats. The 78SC has detailed marine charts for the coastal US and Great Lakes (US Waters) installed so it is perfect for your main source of navigation or as a backup for your ditch bag. Rugged, Waterproof, Floating Handheld Marine GPS. Designed for the avid boater or watersports enthusiasts, the Garmin GPSMAP 78SC is a rugged marine handheld GPS with a highly sensitive, built-in WAAS-enabled GPS receiver for quick acquisition and satellite reception.The 78SC has a 2.6” LCD color display with transflective technology for easy viewing in a variety of lighting conditions. Features of the GPSMAP 78SC include a built-in, 3 axis, tilt-compensated electronic compass which shows your heading even when standing still, plus a Barometric altimeter that pinpoints your precise altitude and tracks changes in pressure to monitor changing weather conditions. In addition, the 78SC allows you to wirelessly share your waypoints, routes and tracks with other compatible Garmin device users. Share your favorite spots by simply touching the send button to transfer data to compatible Garmin devices. The 78SC conveniently comes preloaded with BlueChart g2 for the entire US including Alaska, Hawaii and Explorer chart detail for the Bahamas. With the MicroSD card slot located safely inside the waterproof battery compartment you can add additional maps easily, making your 78SC more than just a marine unit. Add to it any of Garmin’s optional MapSource software including City Navigator for turn by turn routing on roads and TOPO mapping for terrain contours and topo elevations. The 78SC also accepts BirdsEye Satellite Imagery providing you downloads to an unlimited amount of satellite and aerial imagery. With almost 20 hours of battery life with just 2 AA batteries, rubber molded side grips, and the ability to float, the 78SC is perfect for any outdoor enthusiast. In addition get detailed analysis of your activities using Garmin Connect, a feature provided by Garmin that allows you to view your activities on a map using Google Earth. Simply connect your unit to a computer and internet to view and share routes with millions of other Garmin Connect users. The 78SC also supports geocaching GPX files for downloading geocaches directly to your unit. This versatile and waterproof unit comes with many excellent features making it the perfect tool for all your outdoor endeavors. Preloaded with Bluechart G2 Coastal mapping. Waterproof to IPX7 Standards & FLOATS! Barometric Altimeter & Electronic Compass. Ability to Wirelessly Share Information. Display Size: 1.6" x 2.2"
Click here, to view the online Users Manual. 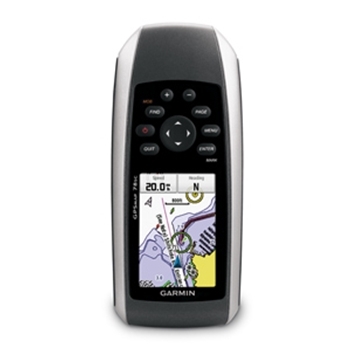 Garmin LakeVu g3 Charting covers over 17,000 US Inland Lakes. Garmin City Navigator North America NT on microSD/SD. Preprogrammed with version 2019. Includes extensive coverage of highways, points of interest and more for North America. Blank 8GB microSDHC with an SD card Adapter Datacard for programming. Garmin MapSource TOPO U.S. 100K microSD/SD Card. 1:100,000 scale. With Garmin’s new BirdsEye Satellite Imagery, you can transfer an unlimited amount of satellite and aerial images to your compatible Garmin handheld unit. The Garmin GPSMAP 78 was designed and built for the marine environment with its sleek waterproof construction and it floats. The GPSMAP 78 can also accept Garmin Bluechart g2 maps or other detailed Garmin street or topo mapping software. The Garmin GPSMAP 78S is a Handheld GPS unit built and designed for the treacherous marine environment. 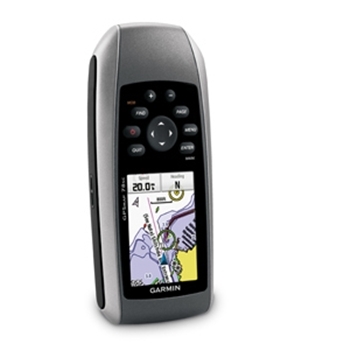 The Garmin 78S is preloaded with a shaded relief map for the US and has a built in 3-Axis electric compass and barometric altimeter. 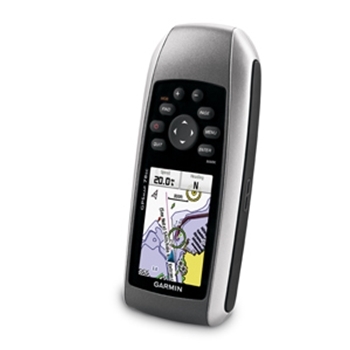 Garmin’s GPS 73 Handheld Navigator provides simple navigation and waypoint marking in an affordable GPS. Adding SailAssist and Marine Features such as MOB, marine Alarms, Route Planning and more the GPS 73 is a great option in affordable, non-mapping handheld units. Plus, it floats!